Spread The Word To End The Word Day was Wednesday, and a whole lot of people wrote a whole lot of powerful posts about the word "retard." Please share them here so we can spread the word even more. Feel free to post ones from previous years, too. Where it says "Your name" put the title of your post, and where it says "Your URL" for the link put the direct URL to your post. Done! 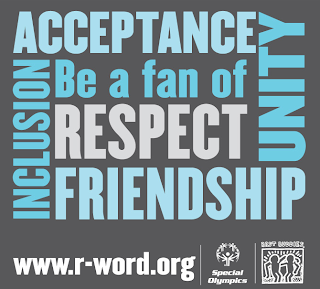 We added a link to a post we wrote last year about the "Spread the Word to End the Word" campaign. It includes a powerful letter written by a mother of two girls, one who has Down Syndrome. Thank you Ellen for doing this link up! Found you through Finslippy and I'm so glad! Great idea! I read many of the comments on your video on Huffington Post and they just made me so sick. I left my positive little one, feeling like I wasn't making much of a difference in the hate and ignorace represented there. Thank you for being willing to put yourself on such a public display to stand up for our kids. This is my third year to write on this subject; things don't seem to be changing on the ground with the young people, but hope and action must continue. Thank you so much for creating this. I'm linking up the one I wrote last year. I admitted to using the word and the day that it was wiped out of my vocabulary. Can't wait to read everyones! Great idea! Thank you for doing this! I didn't really write about it. Instead, I re-posted a few links and video from other blogs. Will be good to have them all in one place, a lot of those posts were amazing!! A post I did a few days ago. A picture of some kids from different families, all labeled with the 'R' word at some point. Thanks for the link up & for your relentless work for our kiddos! Great idea! Love your blog! Conscious language is one of the easiest ways to be a more respectful human being. I put a post up on Strollerderby, Babble.com's parenting news site. Hopefully putting it out there on a mainstream site helps raise awareness! Thank you for this. I actually wrote this last year. I am glad to have a place to share it with more than just my few readers! Thank you -- looking forward to reading! Thanks for doing this. Mine is a private blog so I added a direct link to the video I blogged about. Thanks for doing this-great idea! Mine will be a touch cyclical since one of the posts I liked to was yours! Ah well, what goes around comes around! This is something we've been working on for a long time. Thanks for doing this linkup! Great idea, Ellen (as usual!) thank you. My post there is old and not particularly packing-the-punches but in the spirit of sharing, I thought I would. My all-time fave though is the one your printed on the Parents blog - whose mom was it is? - the little girl in the pool and the mom calling the kids on their words and actions. Great one. Lisa over at Life As I Know It writes some great ones too, on r-word stuff. Not like you needed to know who else writes great posts on this stuff! Haha! You are the best-est at it!! I'm late to the party, I just saw this post via Meriah (with a little moxie) and love it! I didn't write a blog this time, I made a video to say what I wanted to say about it. Thanks! What a wonderful idea! I linked to our post on the R-word titled "Is The R-Word Just A Word, Or Is It A Reflection of Intolerance In Our World?" Love your blog!!! Will become a follower!